Let’s talk about rock painting supplies. Acrylic or Oil paint? Cheap or Expensive Artist brushes? Paint-on Sealer or Spray-on? These are just some of the questions I get from my readers and Facebook group members…ALL THE TIME! But, that’s ok. I would rather have my readers have EPIC Wins with their rock painting projects than have EPIC Fails! 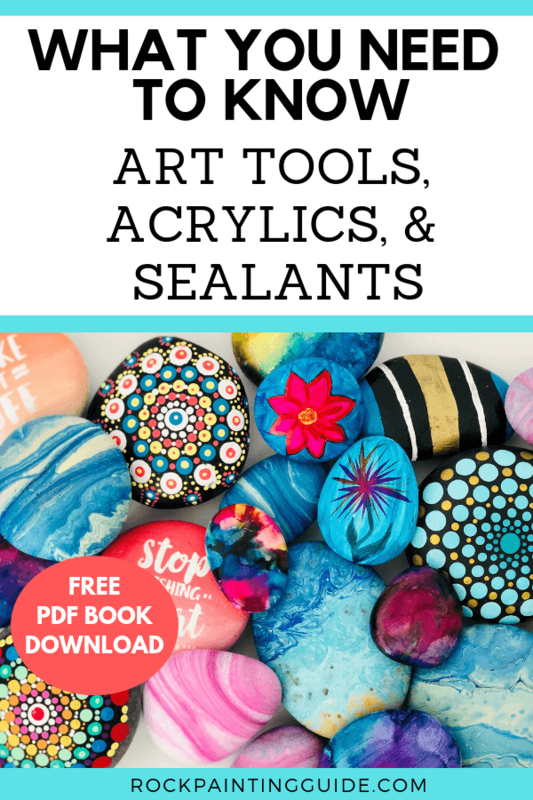 Don’t you fret, this beginner’s guide of rock painting supplies and tools will inform you all about the best paints to use, art tools most commonly used, and the all-important step to rock painting: sealants. 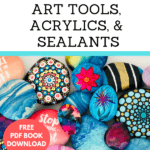 In this Part 2, Rock Painting Supplies Beginner’s Guide Series, you will know what acrylics are and how to use them, the anatomy of a paintbrush and how to clean and care for them, the basics of paint pens, and last but not least the differences between sealants. Acrylic paint is water-based and is made up of pigment suspended in acrylic polymer emulsion. 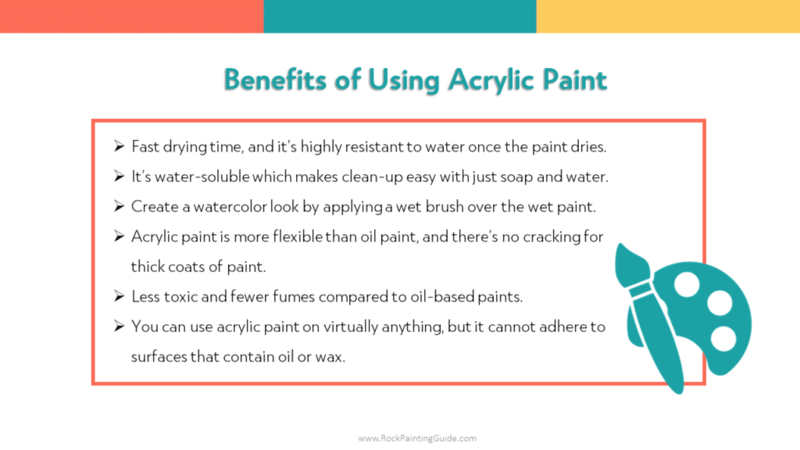 Which means acrylic paint is fast-drying and is highly versatile and can be mixed with acrylic gels, water, pouring mediums or pastes to be used in mixed media art. Craft acrylic paint is the preferred choice for most rock painters. It comes in many colors, it’s cheap and has a thin consistency that’s easy to paint with on rocks. 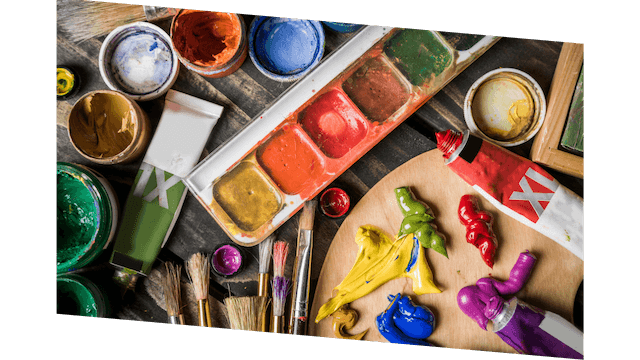 Heavy-body acrylic paints can be used but will need to be thinned down with water or an acrylic medium for smooth thin strokes. Choosing your paints can take a while since there are so many colors and types of acrylics to choose from. You have the thicker matte colors that are good with blending and the beautiful metallics that also blend pretty easily. I find glitter paint to be a bit thinner and require more than one layer to adequately show. There is never a wrong answer when choosing colors though, beauty is in the eye of the beholder. Fast drying time, and it’s highly resistant to water once your art dries. It’s water-soluble which makes clean-up easy with just soap and water. Create a watercolor look by applying a wet brush over the wet paint. Acrylic paint is more flexible than oil paint, and there’s no cracking for thick coats of paint. Less toxic and fewer fumes compared to oil-based paints. You can use acrylic paint on virtually anything, but it cannot adhere to surfaces that contain oil or wax. Mediums can be added to acrylic paint to give it different effects and finishes by making it glossy, matte, or textured. You can also use mediums to change the consistency from thin to thick. Gloss mediums make acrylic paint thinner and more fluid. It also enhances the luminosity of the acrylic paint color. It also makes the paint more transparent and dries to a light sheen. Matte medium will give your acrylic paint a semigloss look since acrylics have a natural gloss adding a matte medium will make the sheen subtle. I have personally used and recommend the following rock painting supplies brands: Deco Art, Apple Barrel, Hand Made Modern, and Folk Art brands. Now, what is an Artist without their tools? For you, this would be brushes. Those that use acrylic paints are lucky because they have a wider range of brushes at their disposal. 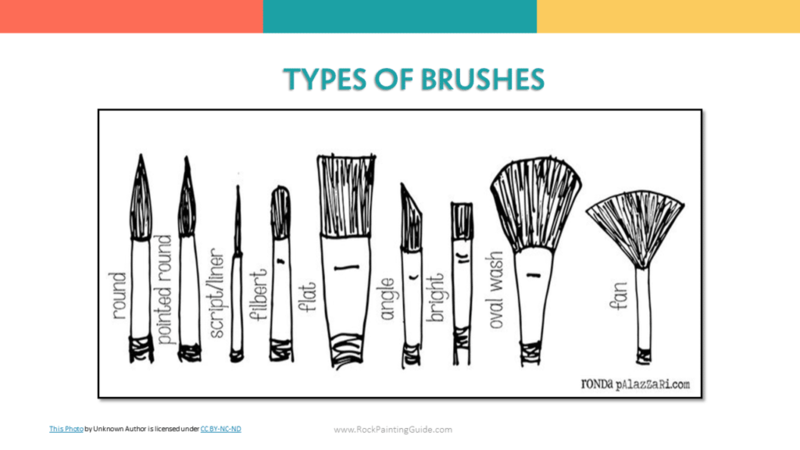 You can use the stiff bristled brushes like oil painters use or the synthetic ones like a watercolor artist uses. It really depends on what you are trying to accomplish. Different techniques require the use of different brushes. Brush size depends on the size of the stones you are painting on. Typically, small size brushes are used for detail work, and mid-size brushes are probably the largest size you will need to for painting on stones. Synthetic brushes are usually made from nylon or polyester material. 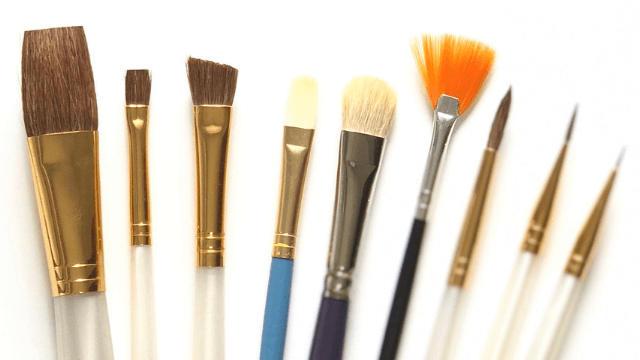 These brushes are recommended for acrylic painting, and it’s easy to clean with just soap and water. 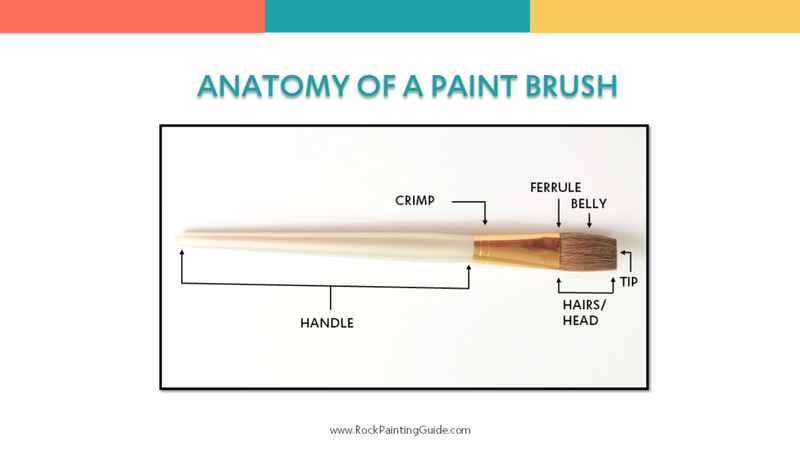 Round Brush – It is rounded with a pointed tip, good for detailing, outlining your work, great for painting in small areas on your rock, and create thick to thin lines depending on the pressure used. Flat Brush – This brush has a square end which allows the paint to be spread quickly and evenly, painting in large areas, can use edge for think lines, and straight edges. Bright Brush – This one is more curved on the side becoming flat toward the top, it is shorter than its cousin the flat brush and also tends to be a stiff bristled brush. It is good for both thinner and thicker paints, and for more short controlled strokes. Fan Brush – This brush is hair that fans out which are good for blending and feathering making trees and clouds. Filbert – These are flat brushes with a more domed shape on the end, they are good for up close detail work and blending edges. Angled Brush – These are versatile brushes have a flat angular tip that can be used for coverage as well as detailed work, they’re good for doing corners and have better angles than other brushes as well as being able to get to small spaces with the tip. Detail Brush – This can also be called a fine liner brush. It’s a smaller version of the round brush. 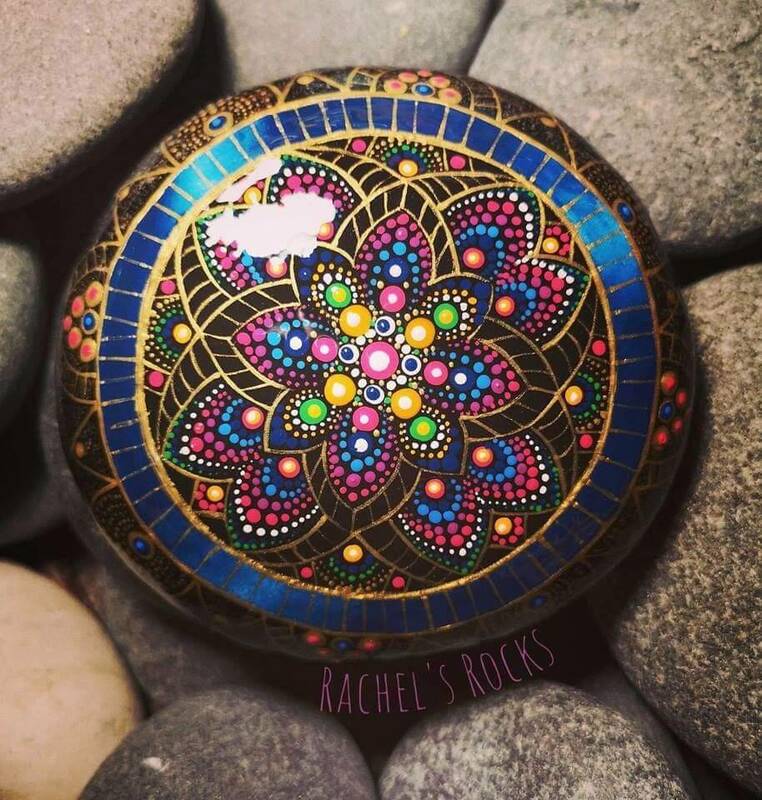 Good for detail work when painting on rocks, creates fine lines, and it also used in Mandala dot art as well. Never let the paint dry on your paintbrush. Acrylic paint dries quickly and that’s why it’s important to keep your brush wet. Dried acrylic paint can be difficult to remove, but is possible. Keep the ferrule paint-free. The ferrule is the part of the brush that connects the bristles to the handle. Getting paint on the ferrule can be a pain to remove the paint and it can also damage the bristles over time. Don’t leave your paint brushes in a water cup for long periods of time. This will distort the bristles causing it to bend and fray. Keep your brushes upright or horizontal to protect the bristles. Dotting tools are most commonly used for making nail art designs but is becoming popular with rock painting too. Mandala dot art can be achieved by using dotting tools and comes in a variety of sizes. 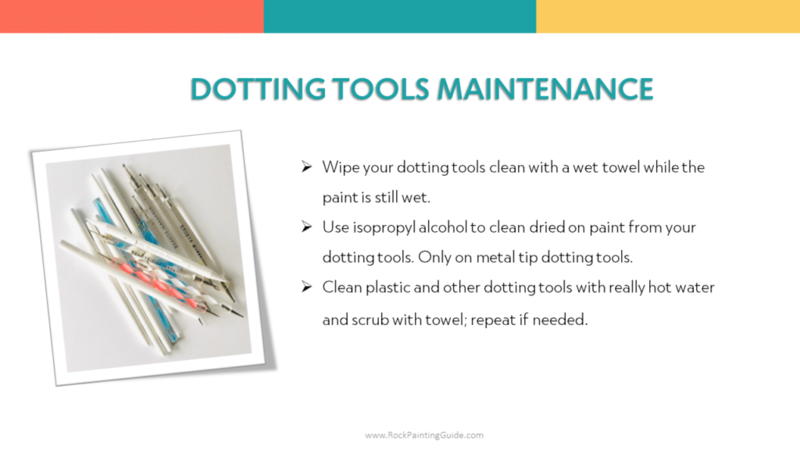 Wipe your dotting tools clean with a wet towel while the paint is still wet. Use isopropyl alcohol to clean dried on paint from your dotting tools. Only on metal tip dotting tools. Clean plastic and other dotting tools with really hot water and scrub with towel; repeat if needed. 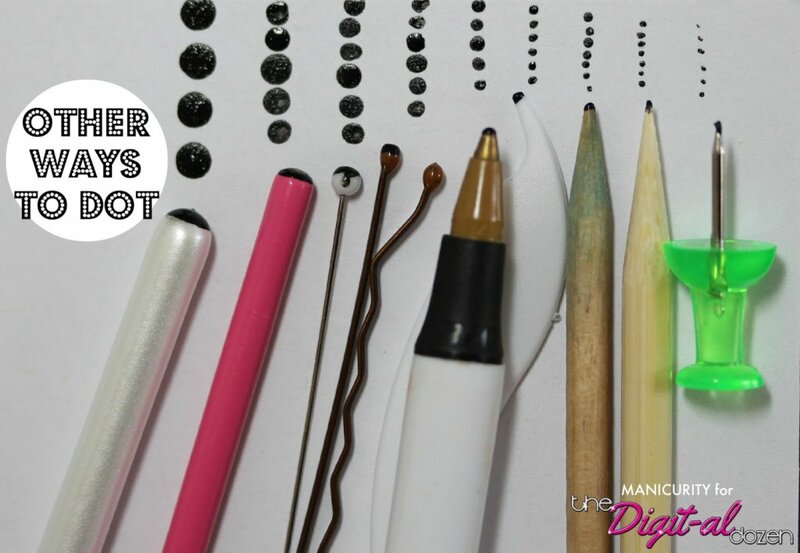 If you’re just getting started and want to save some money then consider making your own dotting tools. 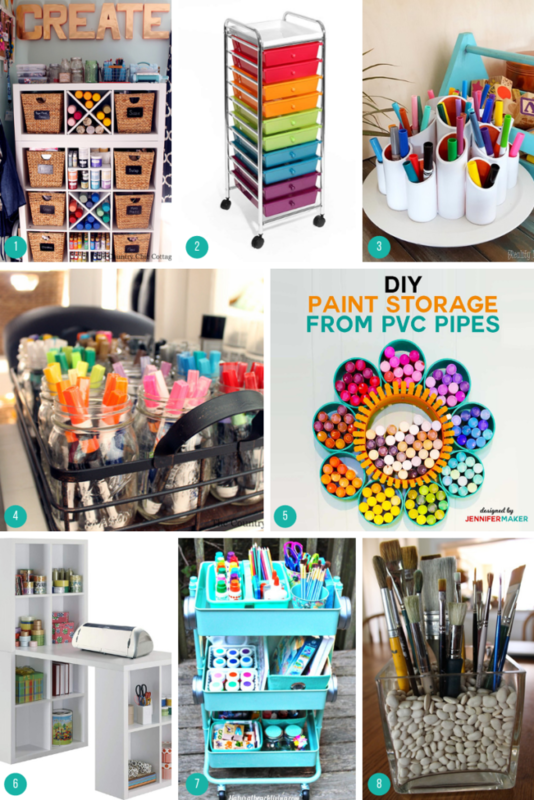 There are some items laying around your home waiting for you to paint with. 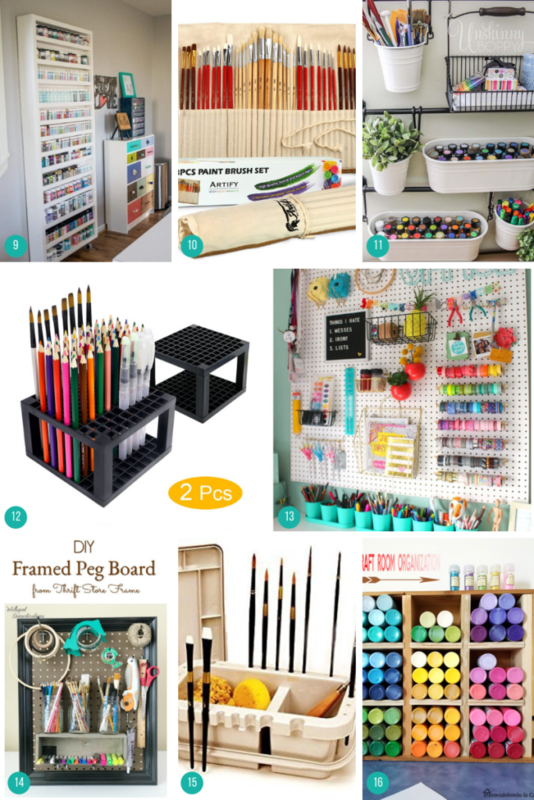 Toothpicks, pencil erasers, the tip of the handle of paint brushes, Bobbie pins, or an empty ballpoint pen. The options are endless! 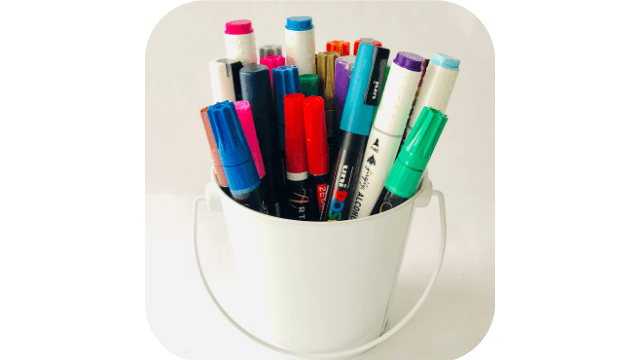 Paint pens or sometimes called paint markers can be used to permanently color or write on surfaces such as paper, metal, rocks, rubber, plastic, ceramic, and glass. Paint pens are available in water-based and oil-based paint and a variety of colors and sizes. Paint pens provide more control than a paint brush for most, that’s why these are becoming “The” most popular rock painting supplies for artists and even more with beginners. 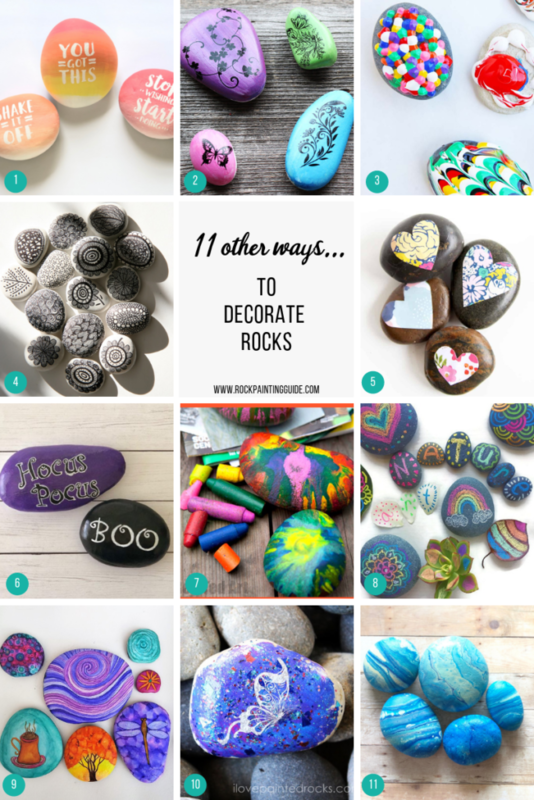 There are several types and brands of paint pens that are used for decorating rocks. Water-based and Oil-based paint pens work well on rocks and it’s up to the painter’s personal preference. Fast dry time and it’s highly resistant to water once it’s dry. It’s water-based, which make clean-up easy with just soap and water. Paint Pens can come in a variety of tips sizes from extra fine to broad. Large selection of colors, metallics, chalk paint pens to choose from many brands available in craft stores and online retailers. Great option for beginner painters to use for detail work. 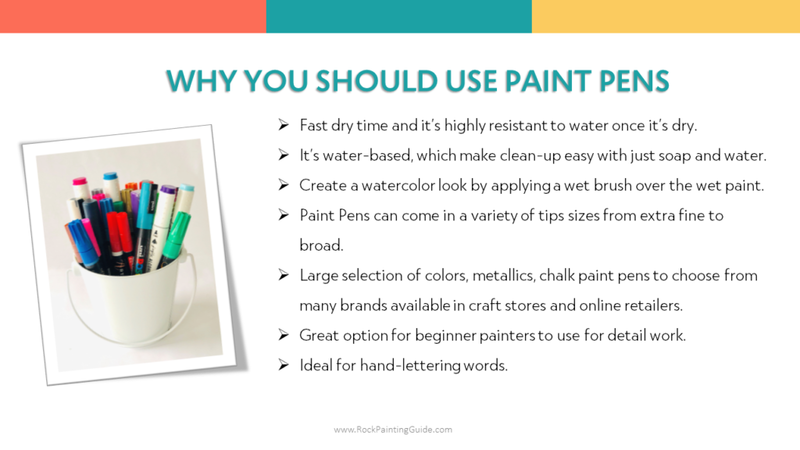 Like acrylic paint, water-based paint pens have a fast drying time and are non-toxic. Depending on the brand of paint pens, some with having vivid colors while others are opaque. Rock painters prefer the water-based paint pens because it’s easier to fix mistakes and cleans up easy with soap and water. The oil-based paint pens will give you the same results as water-based paint pens. Some will have a strong odor smell. It’s also harder to remove if mistakes happen or an accidental stain. Paint thinners can be used to remove paint from clothing and citrus-based soap and pumice can remove oil-based paint from skin. Water-based paint pens are the best beginner friendly option for rock painting. Sealing your painted rocks is still needed to provide extra protection. Uni Posca, Koroyla, and Artistro paint pens are just a few brands I personally used and recommend for rock painting supplies. What will Clear Sealants Do For My Painted Rocks? Using a varnish clear sealer on your painted rocks will provide protection against moisture damage, scratches, and UV rays. There are two types of clear sealers: matte and gloss. Matter sealers will give your rocks a more natural look, on the other hand, the high gloss will make your rock look more like painted glass. Aerosol sealer spray is a preferred option for most beginner rock painters. Spray sealers are quick and easy to use and can usually get the job done in 2 or 3 coats. You must the spray sealer outdoor in an open area, the fumes can be too strong to use indoors. Simply lay out all your rocks on cardboard or something to protect the ground. Start by spraying about 12 inches away from the painted rocks in a sweeping motion to get all around the rock. This is an easy and quick way to seal a lot of painted rocks at once. If you are sensitive to odors, I would recommend a paint-on varnish since it’s odor-free and can be used indoors. Some paint-on varnishes will look cloudy but will dry clear. Simply paint on the varnish over the painted rocks on a protected surface. Let each layer of varnish dry before applying the next layer. I don’t recommend any glue-based sealers to seal your painted rocks, due to the fact that any moisture will cause the sealer to become tacky and will not be effective for outdoor use in humid areas. I do use glue-based sealers for decoupaging rock crafts for indoor use only. Here’s a video tutorial by Miranda Pitrone demonstrating how to apply varnish onto painted rocks. Epoxy Resin is a high gloss sealer that will give your painted rocks a slick, smooth, glossy look. Look for brands that are for home use only and contains no VOCs or fumes. I recommend using Art Resin for your painted rock projects. 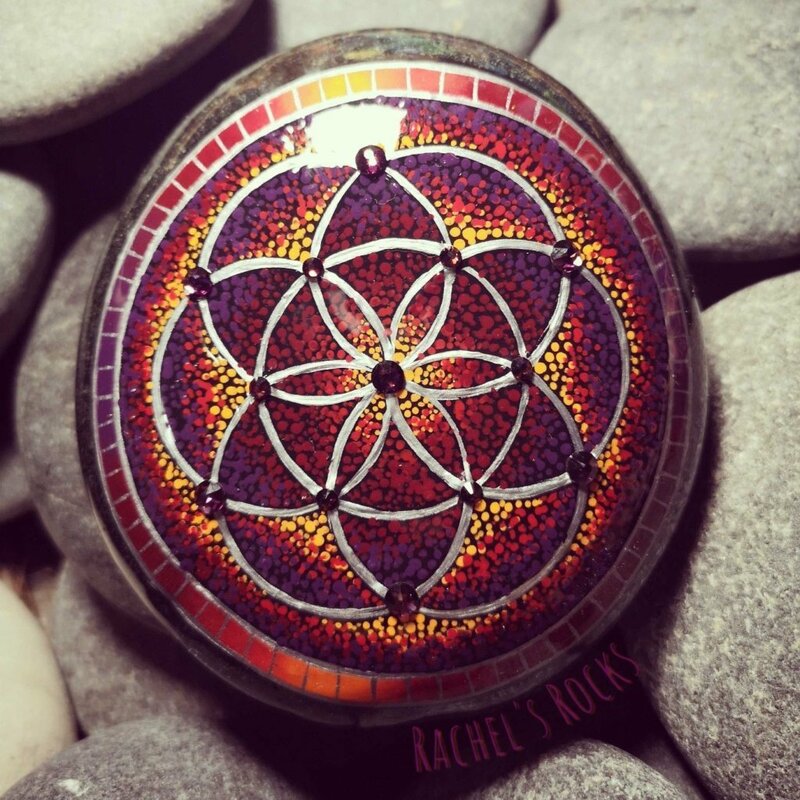 Here’s a video tutorial by Rachel Mitchell demonstrating how to use Art Resin on painted rocks. Sign Up for PDF Download & Access to our Member’s Resource Library! See all of our Favorite Rock Painting Supplies in our Artist Tool Box Essentials Page. In case you didn’t read Part 1 of the Rock Painting Beginner Guide Series, check it out for great rock painting tips and ideas. Keep reading as we cover painting fundamentals and techniques. 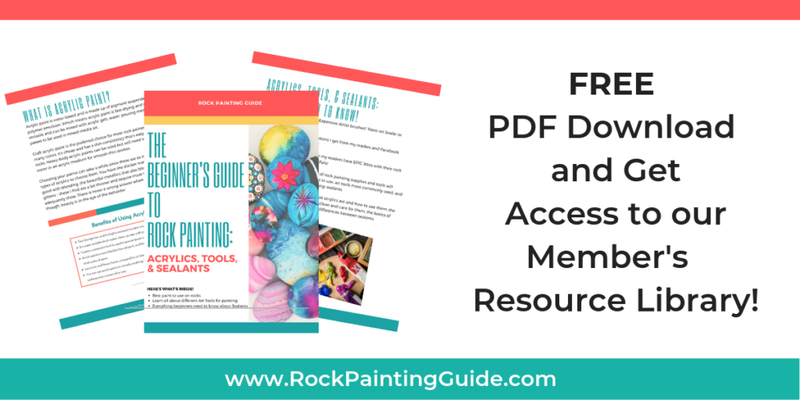 Hopefully, you enjoyed reading this guide and is excited to start your rock painting journey! If you enjoyed reading this guide, please share it with your friends!